Reading ‘A Voyage to Arcturus’ as a youth I find myself indebted to Lin Carter the American author of science fiction and fantasy: although I always liked his work mostly I am indebted to his erudition and his editorialship. If the Ballantine edition of ‘A Voyage to Arcturus’ had not been made readily available by Mr Carter my life would be immeasurably the poorer. Similarly I have to thank Resonance Books for their good sense in making relatively cheap copies of Devil’s Tor, The forgotten Lindsay Classic, available to the general public. I have very little to say about this book. It is expertly and intuitively reviewed here by Murray Ewing. The only thing I would like to add is that I might have been continually reading for thirty five years or so since the discovery of Lindsay’s work. Only having read Devil’s Tor have I been struck again with the same passion and sense of wonder. The book is simply a work of genius. You will never read anything like it again. Science fiction and fantasy aficionados will indubitably be aware of the name Gollancz. Imagine how many wonderful manuscripts this prolific editor had the pleasure of reading for the first time: here’s what he said about Lindsay. I am an indurated publisher. I have read hundreds of novels, but it affected me as profoundly as when I was an impressionable youth and read Poe for the first time! But Devil’s Tor extends far beyond any genre. It is a singular disgrace to those who had responsibility for the safe keeping of Scottish Literature that Lindsay was not recognized as a genius in his own life time; perhaps his vision was too mercurial and perhaps they can be forgiven. However, it is unforgivable that even now his work is only on the fringe of Scottish Literature, acknowledged but not generally extolled. Go to any good bookshop in Scotland and you will find a fairly extensive list of classic Scottish literature – much of merit – but the Devil’s Tor, a book a magisterial magnificence, will not be found. 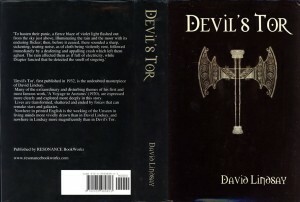 There are 6 Comments to "Devil’s Tor: David Lindsay"
Is the text and typography of the Resonance edition of Devil’s Tor ok? I found one typographical error (although there may be others you can’t read Lindsay without concentrating) The cheap paperback edition was well worth it. Sadly, I think its no longer available. I was happy to get a copy by personal arrangement. Looks slightly different from the edition pictured on Murray Ewing’s website. Black is glossy, grey ax instead of white, and larger font on the spine. Still says “September 2008”. Type looks good, apart from a space jump between every new paragraph. Might have been Lindsay’s original intention, perhaps. I think you’re very right about having to concentrate to read this book. I have looked into a few sentences, and it’s kind of difficult to understand what he is saying. There are also descriptions of very subtle mental states and their facial expressions. I’m going to read this book a little later. It will be a fun challenge! Interesting. Have you read Lindsay before – or is this your first? I suppose you’ve read A Voyage to Arcturus ?